This is a wonderful piano trio album by veteran Polish Jazz pianist/composer Włodzimierz Nahorny with bassist Mariusz Bogdanowicz and drummer Piotr Biskupski. The album presents eleven original compositions, all by Nahorny. Nahorny is one of the original great Masters of Polish Jazz and one of the last few Mohicans, who are still fully active and continue to perform and compose new music. He is not only a great Artist, but also a wonderful human being, warm and friendly, as I have had the pleasure to experience personally since many years. Nahorny and his two companions have been playing uninterruptedly together for almost three decades and are probably one of the oldest Polish Jazz ensembles which exist without any personal changes since its inception. As a result the trio functions as a three-headed body in perfect unity, harmony and coordination, rarely achieved elsewhere. 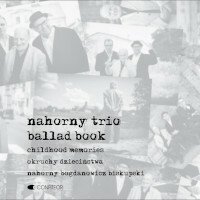 The music composed by Nahorny is in many respects the epitome of Polish Jazz, as it embodies the typical Polish lyricism and melancholy, which characterizes the distinctive sound and feel of the Slavic elements of Polish Jazz. He has been called the Frederic Chopin of Polish Jazz, which is perhaps a bit inappropriate in the strict musical terms, but conveys the spirit of things. The music on this album was influenced by a somewhat nostalgic trip to his hometown of Kwidzyn and reminiscences of his childhood memories, which are both inspiring and emotional. The music is certainly very personal and introvert, but Nahorny's exquisite melodies and superb touch of the keyboards turns everything into immediate feeling of warmth and kindness. Overall this is a beautiful piece of Artistry in every respect, wonderfully, composed, perfectly executed, excellently recorded and elegantly packaged in a digibook format with many photographs and a very personal short essay by Nahorny. This is obviously an absolute must have for the many Nahorny's fans and admirers, but all Polish Jazz connoisseurs the world over should definitely grab a copy ASAP, as Jazz rarely come in better doses than this. Thank you my Friend and may God bless us all with many more years of your health and creativity.